Loud Noises and Tortured Tyres. One month in particular that has flown by is May. Not only did Matt, Aron, Dan and the gang attend Retro Rides at Goodwood, but Lucio, RH Belgium and RH Germany all made the trip out to Austria for Worthersee in addition to Kasuga who ventured through Japan for Vag Cruise; it's been a busy month here at RollHard and we love it. Over the past month, I (Jonny Smith) have stayed a little closer to home, attending both Bank Holiday drift days at Rockingham Raceway. This was quite a new adventure for me personally. Mostly I've been following the drift scene around the world via the internet, following blogs such as StreetTrackLife, Noriyaro, ShirtsTuckedIn and KeepDriftingFun. Watching live D1GP streams at 2am and hours upon hours of videos on YouTube has always left me wanting to have a go at drifting myself and become more involved. Well, since I had bought myself a GT86 earlier this year, finally replacing my beloved Polo 6N, which I have owned for 8 years, I thought it was finally time I headed to some local events and get up close and personal with the world of Drifting. Personally, I really feel like drifting is something I can relate to over and above just the car side of it. The KeepDriftingFun Documentary summed it up for me, with most people interviewed saying that they came from the skateboard/BMX background, which really connected with me. As they aged they felt they'd become a tad too old and fragile to be throwing themselves around on a plank of wood with the risk of serious injury, so they found another safer way to express themselves, and this involved a car. One main thing I have taken from just from following drifting online is that it's more about the fun you have, who you meet and expressing yourself by finding your own style rather than to just one-up others to try and have 15 mins of fame. Obviously, competitions are held but in a very similar way to the skatepark vibe, grass-roots entrants are welcomed and that's something I find I can relate to, which pretty much also sums up Rollhard. It's the journey that makes us after all. Rockingham Raceway - Drift Days. Opened in 2001 after 23 months of construction, Rockingham Raceway became the first purpose-built oval racetrack in the UK since the closure of Brooklands in 1939 with the idea of bringing US oval racing over the pond. This resulted in two Rockingham 500 races taking place over '01 and '02. It's also used for BTCC, British Superbikes and F3. During my recent visits to Rockingham, everyone here was more interested in the lesser-known events, the Rockingham Drift Days of course! It is a great location for guys and girls from around the country to convoy towards, meet up and tandem door to door. With the options of the outer paddock and the in-field track combinations, there are many different setups the guys at Rockingham Drift Days can create. The last two events have taken this advantage to full effect. The first day at the beginning of the month was the outer paddock practice day. Basically, an empty car park, any kind of configuration can be created. With tyre barriers, track lines and clipping points laid out with the course ending with the cars running the wall there was some great driving to be spectated. People cheering with the proximity people were getting to the final wall was a popular reaction, turned up to 11 when it was hit with a 3/4 rear end. Even with the huge queue, which at first looked quite daunting, you felt there would be a long wait between runs. In fact, it actually moved very quickly, giving people just a short break to cool down and compose ready for another run. As the day wore on and people's confidence increased you started to see trains of cars hitting the track, 3, 4 or even 5 cars long. There were some spectacular close runs and near misses but thankfully no serious bumps. Event two on the second bank holiday Monday was set up in the infield part of the raceway confined inside the oval track. With four different layouts. A beginner donuts and figure of Eight's area, an intermediate track, the Lakeside section and the D1GP from 2006 layout there was the chance for unbelievable amounts of seat time for all. 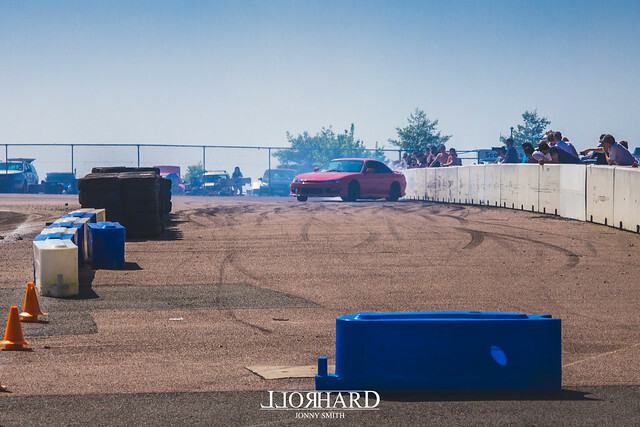 New people to drifting had all-day to slowly build up their confidence and learn, whilst some of the more experienced drivers were able to use the time practising for upcoming drift competitions like the BDC, which was on the following weekend at Teeside. On the two days, me being me, I didn't exactly hurry out of bed in the morning. I ended up, funnily enough, both times arriving just as lunch break was starting. I realised this wasn't actually a bad thing in the end. I took this time to walk up and down the packed to capacity paddock and pits, scouting what cars were there and took the time to get static shots, the way I'm used to taking photos of cars, Kappa. Being relatively new to it all I went pretty much on my own, not really bothered. Just to have a good time, take a heap of photos, learn how to shoot moving objects and possibly meet some new people. Drifting - A Breath of Fresh Air. The Drift scene is a breath of fresh air and such a nice one overall! Everyone was in good spirits, even if they did have to perform a gearbox change or snap/break something to end their day. These events left me wanting to return. Near the end of the day, I found myself talking to others as I wrapped up a last walk through the paddock/pits, talking about how the day had treated them. All replied that they love every second of it. I would have loved to be on track myself. Maybe in the near future I will get the 86 on track and finally have a proper attempt at drifting. But for now, just being on the other side of the barriers/walls for both days was an absolute blast with a highly positive atmosphere. I left with a big smile on my face, thoroughly enjoying each day and straight away looking forward to attending many more, plus seeing what events in the US and Japan I can afford to visit! Look out for more drifting coverage here on Rollhard. All Makes, All Models, One Community! !